When a 2017 wildfire swept through Sonoma County, it was an unprecedented natural disaster killing 22 people and destroying more than 5,100 homes. At the time, the Tubbs Fire was the most destructive wildfire in California history. But the next year, the Camp Fire in Butte County surpassed the devastation in Sonoma County. “Unfortunately, the new normal is upon us,” said Sonoma County Supervisor James Gore, who, along with his colleagues on the Board of Supervisors, is leading the County’s recovery and resiliency efforts. “You either use that fire to forge something better or you get burnt by it.” Gore said the 2017 fire was the culmination of several natural disasters that included historic droughts with the driest year on record, historic flooding with two of the wettest years on record and three different wildfires before the Tubbs fire. While the county was providing emergency response during the fire, its officials were thinking about the future. Realizing that this would not be the last natural disaster, Gore led to the charge to create the Sonoma County Office of Recovery and Resiliency and the Recovery and Resiliency Framework, a strategic plan focused on planning and preparedness before disasters occur. "The first thing is that the Recovery and Resiliency Framework is not just about Sonoma County," said Gore. "It is our attempt to use the trauma and the intensity of what happened to us, to be a part of the state and nationwide movement for true preparedness and true resilience." Gore’s focus on disaster recovery and resiliency extends beyond Sonoma County. He serves as the nationwide chair of the Resilient Counties Advisory Board for the National Association of Counties, sits on the executive committee of the California State Association of Counties and is on the steering committee of the California Economic Summit. The result is a living document that also serves as a strategic plan with 175 actions (55 are completed and 30 ongoing). It is divided into five categories: Community Preparedness and Infrastructure, Housing, the Economy, Safety Net Services, and Natural Resources. Establish an alert and warning system. Work with the community to identify hazards, risks, mitigation strategies, including evacuation routes. Facilitate construction-hardening techniques appropriate for wildfire urban interfaces and seismic retrofits for rebuilding and for existing homes through education and grant programs. 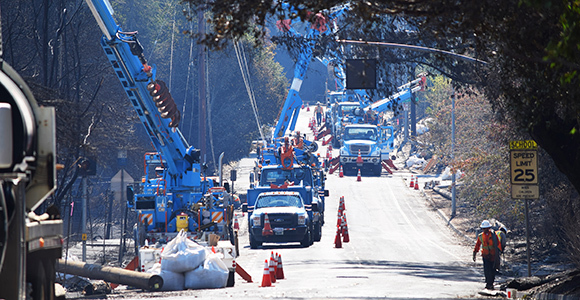 Work with private utility providers on solutions related to hardening infrastructure and on coping with destroyed utilities in a disaster, including undergrounding where appropriate and necessary. Help property owners navigate vegetation management opportunities through partnership with Fire Safe Sonoma and similar programs. Continue to advocate for substantive changes to insurance regulations. Engage the Community to raise Awareness about how to prepare and plan ahead for disasters. Expedited permitting for homeowners who are rebuilding. Develop a one-stop-shop resource center. The Board of Supervisors is supporting the Framework by providing resources to the Office of Recovery and Resiliency. “They’ve taken an unprecedented step of appropriating more than $8 million of secured general fund reserves toward our initiatives,” said Gossman. “Currently $4 million is tagged to secure 22 resilience projects, which brings a total of $48 million in resilience projects from FEMA.” The projects run the gamut of preparedness and resilience for natural and manmade hazards including earthquakes, fires, floods, cybersecurity and more. Additionally, the Board invested more than $500,000 into a new department of Emergency Management and approved the development of a $900,000 per year continual vegetation management and hazardous fuel abatement campaign.